Right out of the box the 1OP guitar will surprise you with its beautiful woods and light weight. 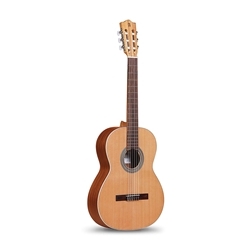 This guitar features an open pore finish which means very little finish is applied allowing the guitar to vibrate freely without restriction. The result is a more lively guitar that is balanced across the frequency spectrum. The 1OP features a solid cedar top and like a good wine, solid tops age and become better over time. This means: the incredible sound you get out of it will get even better as the years pass.